We at the Cuyamungue Institute find much hope and encouragement in the revival and preservation for what our ancient ancestors and their wisdom traditions have to impart about living in balance with Nature and the web of life. Such wisdom is increasingly accessible today, on many fronts. Since 1979, when CI founder and anthropologist Dr. Felicitas Goodman revived an ancient practice of spirit journeying, she felt she was contributing a unique and long-lost technique to this growing global movement. She had decoded one of the ways in which our earliest ancestors tapped directly into a source of the traditional wisdom once shared around the globe. These ancestors were adept at journeying to an Alternate Reality in which they could communicate directly with the spirits. This capacity is built into our very physiology, the same physiology shared by those ancestors, to safely and naturally shift into altered state of consciousness. While brain-mind research today reveals that we go in and out of various states of trance on average of fifty times a day, our ancestors discovered this early on, becoming masters of brain-mind engineering. They did so through ritual. This became clear to Dr. Goodman, who spoke and wrote eight languages, as she translated many of the 488 ethnographies collected in a ground-breaking study funded by the National Institute of Mental Health. The quest, to determine if visionary “spirit journeys” were a pathology, as Western medicine was quick to categorize the unfamiliar, or the beneficial and healing practices that indigenous cultures claimed it was, found that well over 90% institutionalized such practices as central to their cultural well-being and identity. Compiling a short list of the ritual steps these cultures had in common revealed the essential, universal “formula” for trance induction, stripped of any one cultural overlay or belief system. To this Dr. Goodman added a key element overlooked by Westerners. From the archeological record, she found artwork among the hunter-gatherers and early, pre-agricultural horticulturalists that depict people in simple sitting and standing postures, yet with very precise hand and arm positions. The oldest she found in the painted caves of Europe. 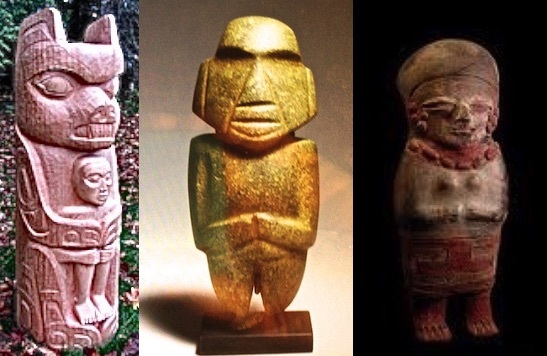 Several postures were repeated around the globe, over many millennia, in cultures that had no contact. She deduced these where instructions on how to hold the body during the ritual activation of the shift. Volunteers among her anthropology students at Dennison University in Ohio found their visionary experiences deepened and heightened into ecstatic states, with visions sometimes relating to additional clues the artist had left in the artifact. Today, this work is practiced by thousands of people around the world. Laboratory tests conducted in the 1990’s revealed this ritual gives rise to a very specific type of trance. It’s notable for healing and profound experiences, visionary and multi-sensory in the fullest sense, all without ingestion of botanical or pharmaceutical agents or any other outside influences. While we believe that much more goes on in the brain, body, and mind than can be seen in the lab, what we do see in easily measured parameters are marked shifts within safe limits. These include, paradoxically, a decrease in blood pressure yet an increase in pulse rate. Blood work shows a decrease in stress hormones and dramatic increase in endorphins, sustained for hours after, supporting the experience of ecstatic well-being. EEG tests show the unusual state of remaining in the Beta waves of ordinary awareness concurrent with Theta, the brain wave of deep sleep and dreaming, explaining the experience often described as a “waking dream”. Further tests on the DC potential of brainwaves show a ten-fold increase from the 250 microvolts of ordinary awareness to 2,000 to 2,500 microvolts. This is a highly energetic trance state, very different from meditation techniques in which the mind quiets down. I am flying in the clouds. I am joined by birds, who surround me and welcome me into their flock. Then I find myself in a forest. Wolves appear, happy to see me, they encircle me and welcome me too. Later, I am in a cave. Snakes come out of the walls, curling up around me. They too welcome me. I am overwhelmed, feeling deeply comforted, knowing I am accepted and embraced by these animal spirits on behalf of the whole universe. We first met Dr. Goodman over the phone in 1995, when she was a guest on our nationally syndicated radio talk show, The Laura Lee Show: Conversation for Exploration. Intrigued by her work, we were soon attending one of her workshops annually. Today, as co-directors and co-teachers of this work, we oversee the institute, continuing the summer season of workshops and the on-going research mission. The Cuyamungue Institute is a 501-C-3, with headquarters and retreat center housed in a collection of adobe buildings set on 500 acres on the northern edge of Santa Fe, New Mexico. With more than 35 years of experiences, The Bear Spirit Posture is a wonderful example of a our practice and provides a consistently strong experience of healing when utilized during the Cuyamungue Method. Among small societies around the world, the bear has been identified as the animal spirit most called upon for healing human ailments. In reporting on The Yavapai of southern California believed Bear was the first great shaman. The prototype for the Bear Spirit Posture is a Kwakiutl wood carving of a shaman standing in the posture with a huge bear standing behind him and presumably empowering him. Used as early as 6,000 BC, this posture involves visuals of bears or feeling bears doing something to you. 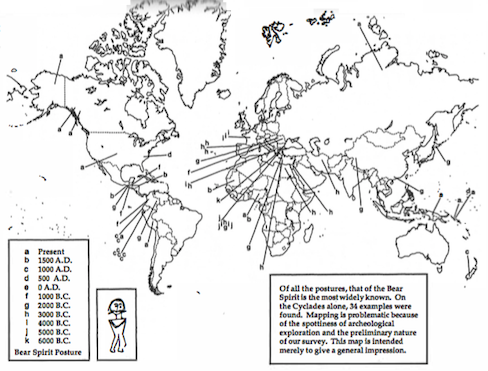 Bear Spirit Posture map indicates worldwide use and wide range of dates in history. Here we provide a few cultural examples of Bear Posture sculptures. Goodman, F. D. Where the Spirits Ride the Wind: Trance Journeys and Other Ecstatic Experiences. Indiana University Press, 1990.